In Photoshop, as installed under Windows, You can choose between Adobe’s ACE color engine, and Microsoft’s ICM when performing color space conversions. I have been using ACE up to now. I wondered if ICM could produce more accurate results. I took the 256 million color sRGB noise image that I’d created earlier and made some one-way transforms to Adobe (1998) RGB and ProPhoto RGB, then measured the accuracy using Matlab. The first think I noticed was that the ICM transforms take a bit longer. That gave me hope that they might be more accurate. The second was that ICM, unlike ACE, respects your choice of Absolute rendering intent when converting among RGB working spaces. 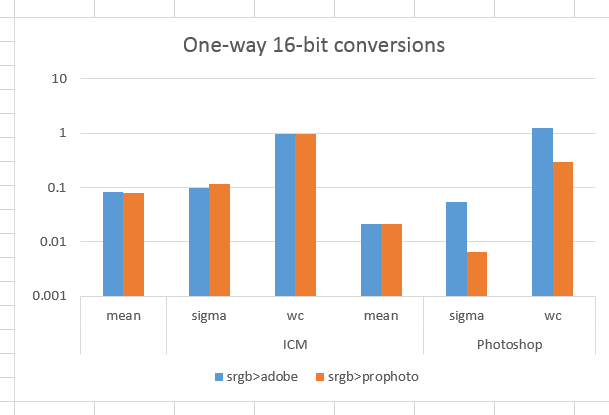 The ACE worst case on the sRGB>Adobe conversion is slightly worse. In all other respects, ACE (labeled Photoshop above) is better. ACE is much better. 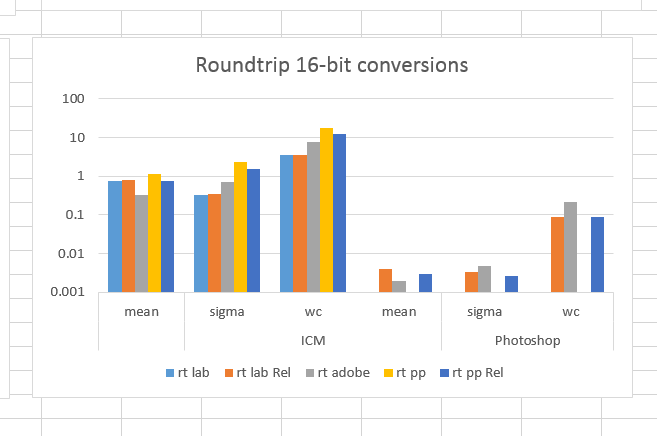 In fact, as far as I’m concerned, the high worst-case round trip errors for ICM conversions make it unsuitable for things like a quick conversion to Lab and back to do some tricky color editing. For the record, I’m using Photoshop 2014.1.0 CC x64, running under Windows 7 SP1 x64. The one advantage of Microsoft ICM versus ACE in Photoshop CC is that it allows you to run a true 30 bit display with a firepro card in Win 7 64bit with aero switched off. In Photoshop CS6 this was possible with ACE, in CC it isn’t unless you switch to Microsoft ICM as you can see with a 30 bit test image. Apparently Win 8 and 10 abolish all that altogether. So we’re going backwards, huh? Yes, unfortunately it looks very much like we are going backwards. I have been pfaffing around for ages trying to get 30bit going with CC without success and from what I gather Adobe acknowledge that there is a problem. I don´t claim to understand what they have done as it looks a bit as though some half hearted attempt was made to rectify this but it doesn’t look like a complete fix and only switching to Microsoft ICM gets you back to 30bit in CC. Great shame as I can actually perceive a difference especially with skin tones. I’ve noticed the most recent Photoshop CC as of Dec 2018 now properly handles 30 bit monitors. Not only that but they fixed some bugs in soft proofing. A soft proof of Rel Col with show paper white (and black ink) should produce exactly the same display as converting to device space, using the same settings then back to RGB space using Abs. Col. It previously did not producing really weird differences in dark shadows. Now it does and side by side the results are identical.